Is the Foscue Plantation House Haunted? 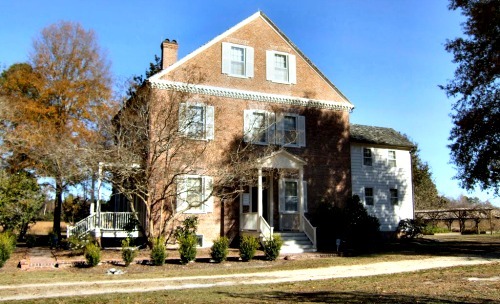 The Foscue Plantation house is a rather unique 3 Storey brick house built in 1826 by Simon Foscue, who held the position of Justice of the Peace for the state, which at the time was one of the most powerful positions in county government in the United States. The plantation today is a beautiful place, lined with crepe myrtle trees and boasting some interesting features of its build, such as every brick being hand made on the plantation. Its past was not so nice though as the plantation kept a high number of slaves when it was in operation. It flourished economically before the civil war and records show that Simon Foscue Jr owned 19 slaves in the year of 1830, and Simons son, John Edward Foscue owned 23 in 1840, and his widow, Caroline Foscue was recorded as owning 48 at the outbreak of the Civil war. This was an unusually high number of slaves to have at a plantation, even one that was in an area known for having high numbers of slaves. Since the plantation supported the south during the war and relied heavily on the free labour of its slaves, it suffered greatly in economical terms after the war and saw its family fortune dwindle to a mere shadow of what it once was. Today the house is open to the public for tours and can be booked for various events such as weddings, and is well worth a look around to see what life was like 200 years ago. But if you wish to visit then please check with the venue directly to ensure opening times. Normally any plantation house or manor type home is often haunted by one of its past residents, but in this case there was much more suffering endured by the workers of the plantation than any of the owners, giving them much more basis for their pain to "linger " here. The spirits of slaves are thought to haunt all areas of the plantation, from every room in the house to every part of the plantations outer grounds, and with goods reason according to the stories. The attic of the house is thought to be the hot spot of the plantation, with a popular story telling of how troublesome slaves would be taken up there to be chained up against the walls for days at a time, with next to no food and being regularly whipped or beaten. People have claimed to have heard the muffled sounds of crying and moans of pain coming from this area when it is been known to be empty. Also objects have been known to move on a regular basis in this area, with no rational explanation of how they can shift themselves across the room. There are also various tales of people have claimed to have seen the apparitions of the slaves across the grounds of the plantation, being described as shadowy figures walking along before fading away into nothing when they are approached. The house is thought to be one of the most haunted in the state with some people claiming that you can experience something paranormal everytime you come here.